The grinding mill manufactured by SBM Machinery can produce a wide range of micron size of chemical purity, outstanding brightness and controlled particle size distribution. The ground calcite powder has better dispersion and excellent physical properties in various polymers/plastics application. Calcite powder is widely used in all kinds of industries like rubber industry, paints industry, Construction Chemical, Plastic Industry, Tiles an Ceramic Industry, Pharmaceutical Industry, Toothpaste Industry, cement, steel industry etc. The Coated Calcium Carbonate powder is used in plastic compounds manufacturing to avoid moisture contains. 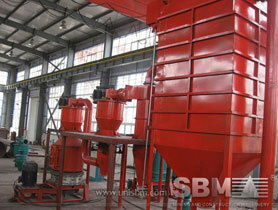 The calcite grinding mill is the main calcite powder making machinery. SBM has set up the calcite powder production line in India with ball mill. The calcite powder grinding plant can produce 250 mesh powder. "Grinding equipment manufactured by SBM is widely used in all the calcite powder, coated calcite powder production plant. "